Life Fitness recently introduced an entire new series of indoor cycling bikes to complement their popular Lifecycle GX, giving you more choices for your home gym. With something for every budget and fitness level, these durable, well-designed exercise machines are sure to be a hit. There are currently six new Life Fitness indoor cycles to choose from, starting with the base IC1 and moving up to the top of the line IC8. As you move up in the lineup you get more durability, higher max weight capacities and additional features and capabilities. Beginners will be just fine with one of the lower levels models, while more advanced users might benefit from the extras that the upper level bikes give you. The base model in the series is the IC1, which is also the most affordable at around $999 on sale during our latest review. You get a smooth and quiet Poly-V belt drive, a basic computer showing your heart rate, distance and calories, 1:3 gear ratio, 40 lb. steel flywheel, multi position handlebars, padded, adjustable sport seat, rear transport wheels and a 287 lb. max weight capacity. We're not sure what happened to the IC2 or IC3, but the next one up is the IC4. This one features a much more modern, sleek design, yet for some reason does not have an on-board computer. 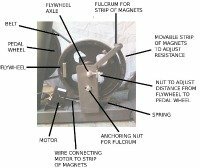 It adds magnetic resistance, a smaller Q factor than the IC1, 1:10 gear ratio, aluminum flywheel and a 330 lb. max weight. The Life Fitness IC5 is very similar to the IC4 looks wise, but adds a unique Watt Rate LCD computer, with Bluetooth capability, touch sensor buttons and Coach By Color guide that shows your performance level. You also have the option of adding a Myride VX Personal attachment, with training videos and built in apps with real destinations. The Life Fitness IC6 adds a more advanced WattRate Color TFT console in addition to everything you get on the IC5 indoor cycle. The IC7 indoor cycle adds the WattRate direct power meter, 300 degree magnetic resistance and a 1:11 gear ratio. 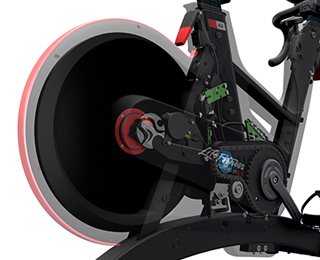 The IC8 has a chain-driven flywheel, 0-3800 watt resistance, Wattrate Polar view and more adjustability than the other Life Fitness Indoor Cycles. Which Life Fitness Indoor Cycle Should You Choose? All of the new Life Fitness Indoor Cycle Bikes are great, and regardless of which one you pick, you're getting a gym-quality machine that gives you everything you need for a solid cardio workout. Which one should you choose? It really depends on your budget and your wants/needs. If budget is a concern, start with the IC1 Indoor Cycle and see if that has everything you need. That one is considerably cheaper than the rest, at around $999 on sale. For those looking for a little more than the basics, take a look at the Life Fitness IC5 and IC6, perhaps our favorites of the lineup. We would like the IC4 more if it had a computer, but it doesn't, so we would jump to at least the IC5. You get the sleek new look, and the addition of the WattRate display so you can monitor your performance. You also get a better Q factor (closer is more natural) and a higher max weight capacity than you get on the entry level Life Fitness IC1 Indoor Cycle. We would recommend the IC7 and the IC8 for more serious trainers, those who are looking for a more on-road experience with more adjustability. The IC8 is the only Life Fitness bike with a chain drive, as opposed to the Poly-v belt drive on all of the other models. Most beginners and intermediates don't need the level of performance offered by the IC7 and IC8, and will be better served with the IC5 and IC6 intermediate models. Also consider the older LifeCycle GX, which is more in line with one of the lower level newer indoor cycles. How Do the Life Fitness Indoor Cycling Bikes Compare to the Competition? Life Fitness pioneered the indoor exercise bike, and remains a leader in the space with very little real competition. There are however some other players in the space that you might want to consider. Precor recently introduced an entire line of indoor cycling bikes called Spinner, with a number of different chain and belt drive models to choose from. 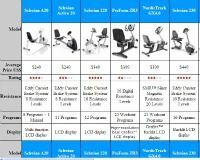 Prices are similar to the Life Fitness Indoor Cycles, and definitely worth considering. A company called Keiser has one model that is very popular, called the M3i Indoor Cycle. That one is typically under $2000 when it's on sale and is also worth taking a look at. 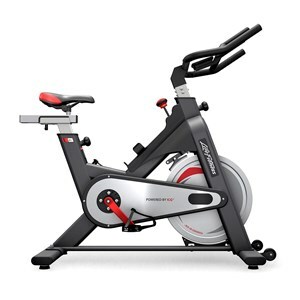 Schwinn also has one model called the AC Performance, which is very popular like the Keiser M3i, and the two indoor cycles compete with each other head to head. Any of these is a great choice, and there are plenty of great models to choose from. 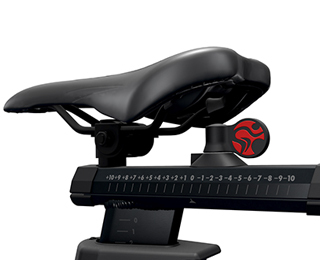 We really like the new Life Fitness IC Series because it gives consumers the ability to choose the models that most appeal to them, rather than having to select the one indoor cycling bike that a company offers. Again, our favorites are the entry level IC1 if budget is a concern, and the IC5 or IC6 if you are able to spend a little bit more.